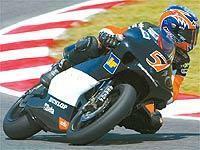 British 250cc GP rider Chaz Davies is still not 100 per cent sure where he'll be riding in 2005. Davies finished the 2004 season in 13th place on a 'kit' Aprilia machine. The 17-year-old, who made his debut in 2002, ended his season with a sixth and fifth at the final two rounds at Phillip Island and Valencia. He is close to extending his GP career for one more season in an effort to grab a factory ride for 2006, but has been tempted by an offer to join the British Superbike series. Tell us which option you think Chaz should go for by following the link on the right.